Doc back with some more preparation for the Cypra Incident: Birth of the Beast of Cypra campaign. Firstly I have added a couple more Thunderwolves to take me up to a full squad of 5. These two have been added as none of the other 3 have high strength or AP2 weapons which has proven to be a weakness in the past. I have to say I really love these models! 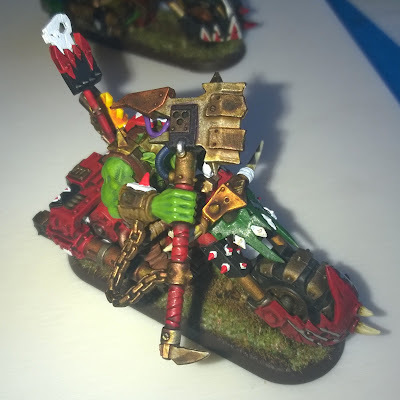 I have also kit bashed together a rune priest on a bike for not other reason than I thought it might be a nice option. I will give this guy some glowing eyes in the paint job and paint the runes on the sword to glow also. He is also covered in many totems as befits his position within the chapter. 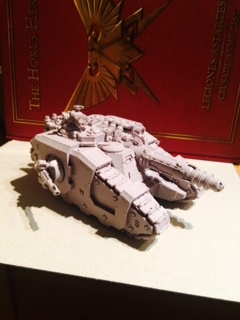 My list for the 2nd tier mission uses a Taurox which up until a couple of weeks ago I didn't own. So off I went and ordered one from my FLGS Worcester Wargames and also ordered wheels and a suspension kit all the way from Australia via Victoria Minatures. So being as I wanted to test my video skills or complete lack there of I thought I would do a short explanation video on the tank. See below and go gentle on the comments I am a NEWB! Any advice on editing and so on go for it. For info this is filmed on an IPAD mini I cannot afford any spangly video equipment. 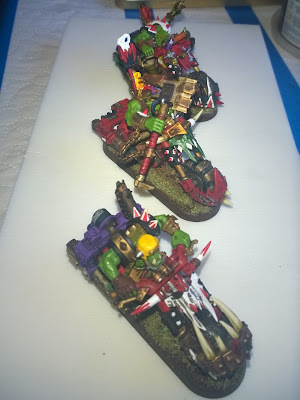 The Great British Build Off - Pre Heresy Death Guard - Masses Now Built, Re basing - Big Jump Forward! DOC here to showcase a big leap forward on the construction of the pre heresy death guard. Here follows a giant picture dump showing all the models I have built for the death guard. I have also in the build process re based a load of my death guard on to 32mms. 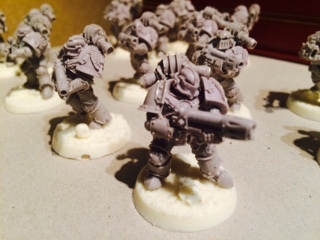 These are 40k marines as I will use this army in 40k as a space marine army. 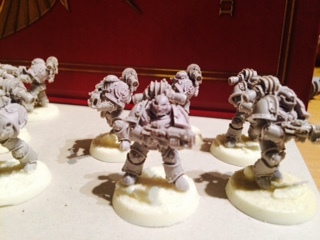 Sternguard Vets - The best spare bit kit in the GW range! Devastators - Mixed bag made from my bits box but all good! 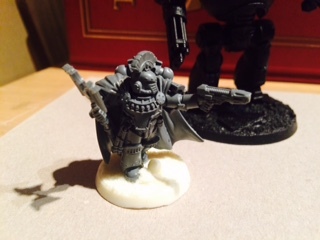 Vanguard Vets and Chaplain - great models and again loads of bits! So having bought 100 32mm bases I have no used them all up and ordered another 50. I really am aiming to get this into a usable state before the painting begins. 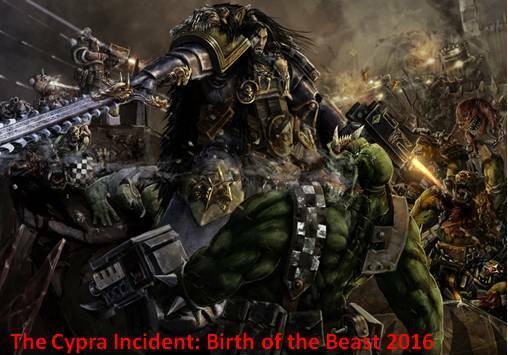 40K Narrative Campaign 2016 "The Cypra Incident; Birth of The Beast of Cypra", New Ork Bikers Showcase. 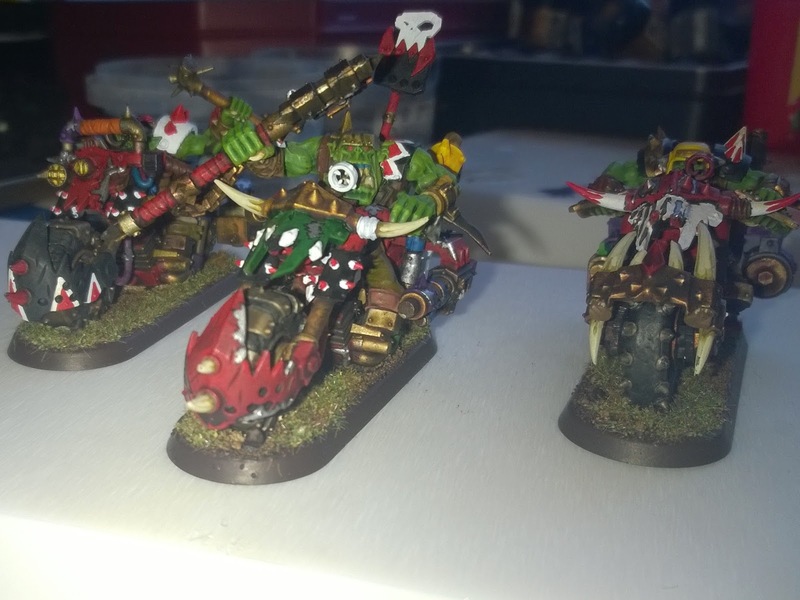 All ready for the call to war are Biker Boss Nob ZagSkrag BigWeelz and a couple of his ladz! ZagSkrag will be part of whichever tier 2 mission we end up playing; either Recon or Motor Pool Assault. 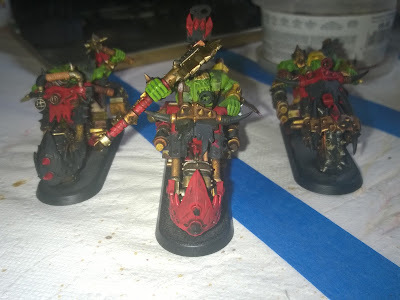 I've really enjoyed getting back into the Orky Spirit with the build up to this campaign. 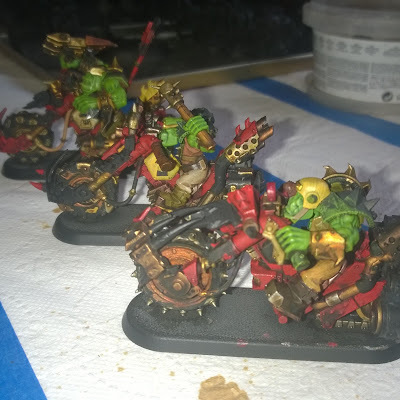 The hardest part of the painting has been trying to keep the look consistent with my existing Ork collection; I started my Orks back in the 90's with a very different paint collection and a completely different skill level! 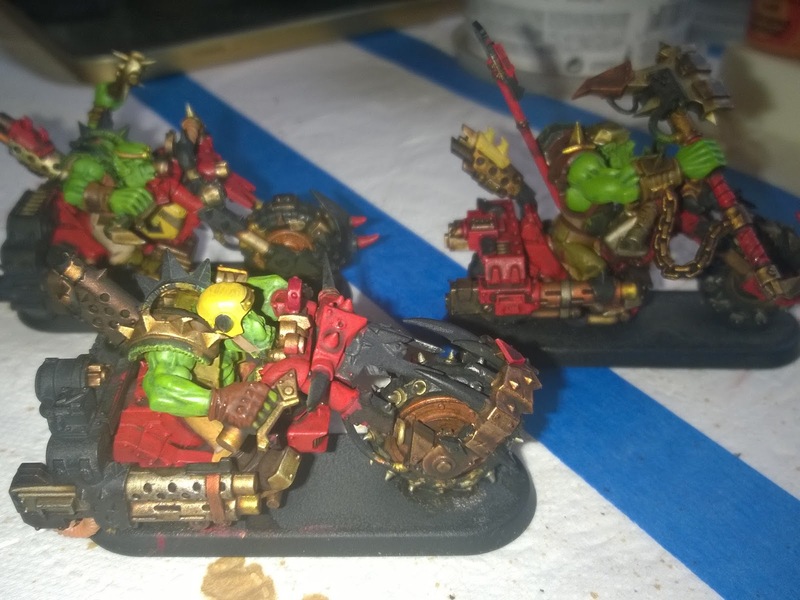 Pleased with these, I'll defo be painting the rest of my bikers, including a whole load of Nobs. 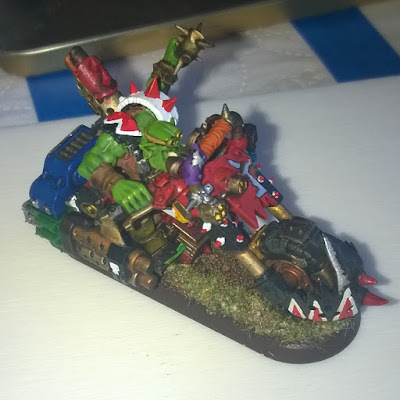 next up I'm moving onto my Lootas, this will complete everything I'll need for the first campaign day since I did a pair of quick weapon swap outs on a buggy and a kan rather than paint new ones from scratch. Hope you like, c and c welcome as ever. 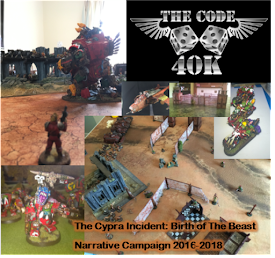 40K Narrative Campaign 2016; "The Cypra Incident: Birth of the Beast of Cypra". 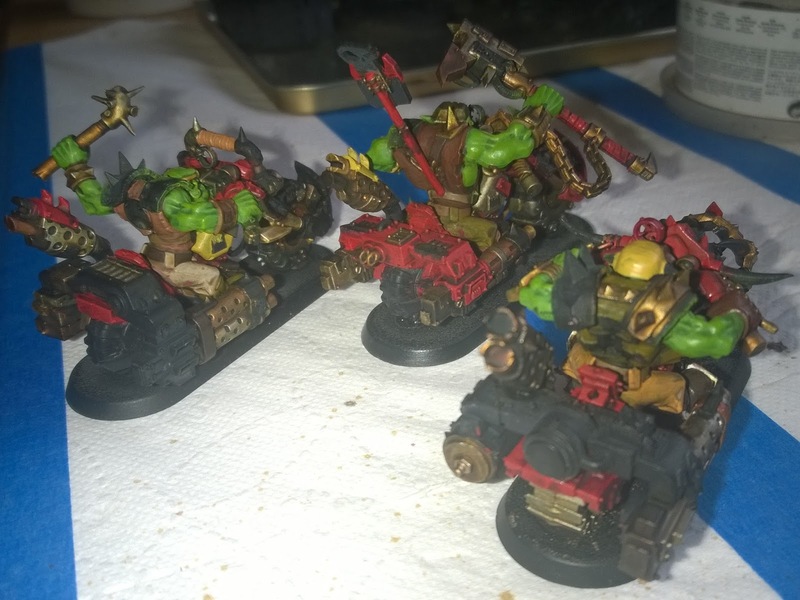 An introduction to the Orks of Waaagh! Bluddtoof. So here's my first post in our series on the Narrative Campaign myself and Doc are playing this year. 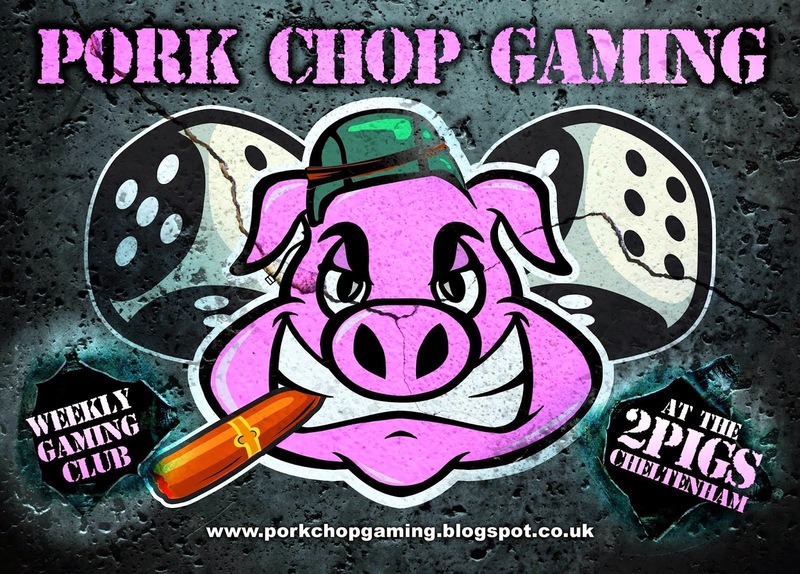 We hope to play our first session, which should cover the first 2 engagements in the conflict, sometime in February. As I'm writing this that gives me about a month to paint all the extra bits I'll need for those games. we're using a tree campaign system so that means 1 definite and 2 potential lists, the 2nd mission will be dependant on the outcome of mission 1. 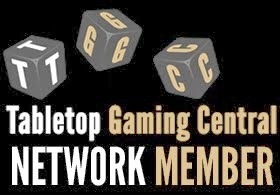 We've decided that we want the campaign to be all about the story so we're putting a lot of time and effort into creating interesting and balanced missions with all the lists being discussed and altered mutually so as to create games which have the best chance of being close and exciting. When it come s to playing the games we'll be taking it slow and discussing tactics and moves as we go to create the best story possible, keeping the option to "do over" if the dice gods chuck us a curve ball! 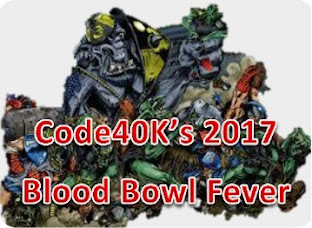 I'm really looking forward to it and I hope you are too because we'll be posting detailed narrative battle reports all the way through to the Glorious Ork Victory which is of course inevitable! 3 Ork bikers, including a Boss Nob. I know Doc is frantically building and painting the mechanised infantry of the "Dicers", his new regiment of puny 'umans! 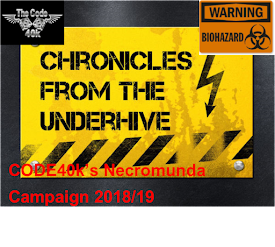 Stay tuned for more on "The Cypra Incident"
40K Narrative Campaign 2016; "The Cypra Incident: Birth of the Beast of Cypra" - The Setting, Launch, What's this all about? "The Cypra Incident: Birth of the Beast of Cypra"
Firstly this is what I hope will happen to Bluddtoof! This campaign will be a narrative ladder campaign and I will discuss how we arrived at that decision below. So as the title may have alluded to this post is all about the select few marines who get trained by the adeptus mechanius to work with machines. 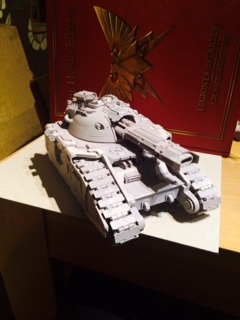 I have been itching for ages to get some built for a couple of my armies and have been hoarding parts for this purpose for some time. First up is a basic techmarine picked up by red mist (thanks bud) on ebay. Clearly a paint stripped model I am looking forward to bringing back to life on the table top. 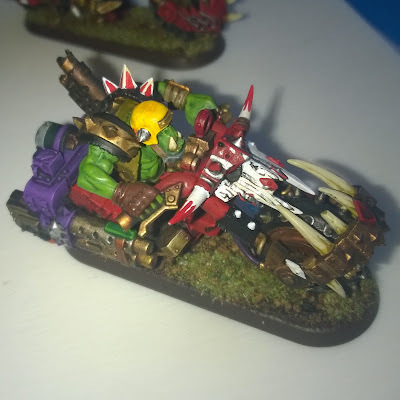 Next up is a converted techmarine on bike carrying an auspex (I hate over watch!). Again the biker was picked up by innermech of all people and he gave him to me saying he would be good for your techmarine on a bike (Yes you are correct bert many thanks!). I have used Iron warrior back pack parts to convert up the servo arm. Really pleased with this simple conversion. Last warrior to be trained by Mars is a new Iron Priest. I have been again planning this for some time. 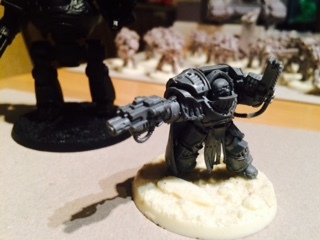 Like the techmarine on bike the back pack is made using Iron Warrior parts. The chest plate and shoulder pad are tech parts too showing the correct iconography. 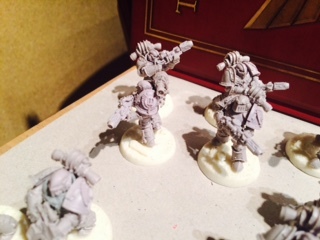 To go alongside the Iron Priest he has 4 converted cyberwolves. 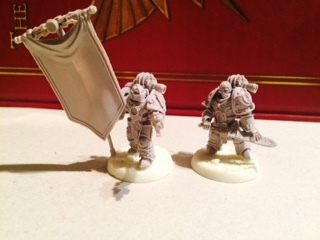 These are simple conversions of the Waargs from the GW lord of the rings range given to me by Hendrix (cheers!). There appears to be lots of bits accumulated for these projects from many within the code group. 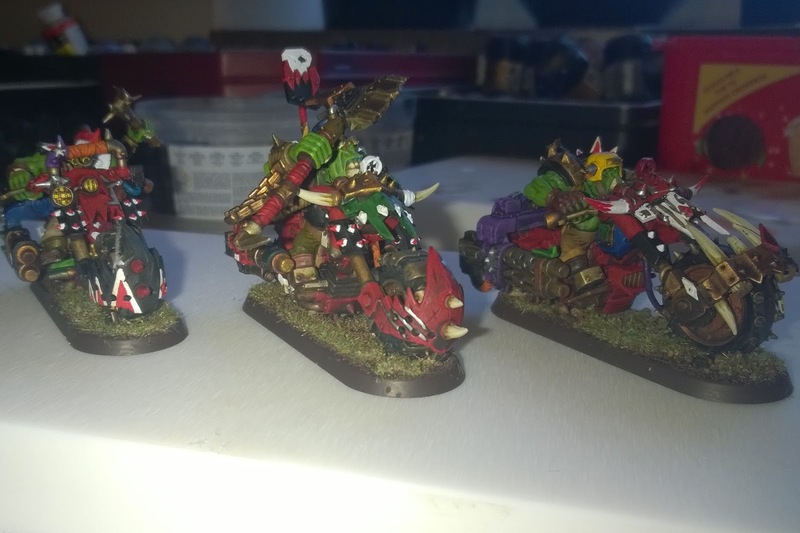 Last on this post I have also based up a load of wolves (former goblin wolf riders wolves) to make a load more fenrisian wolves. This now takes me up to 40! 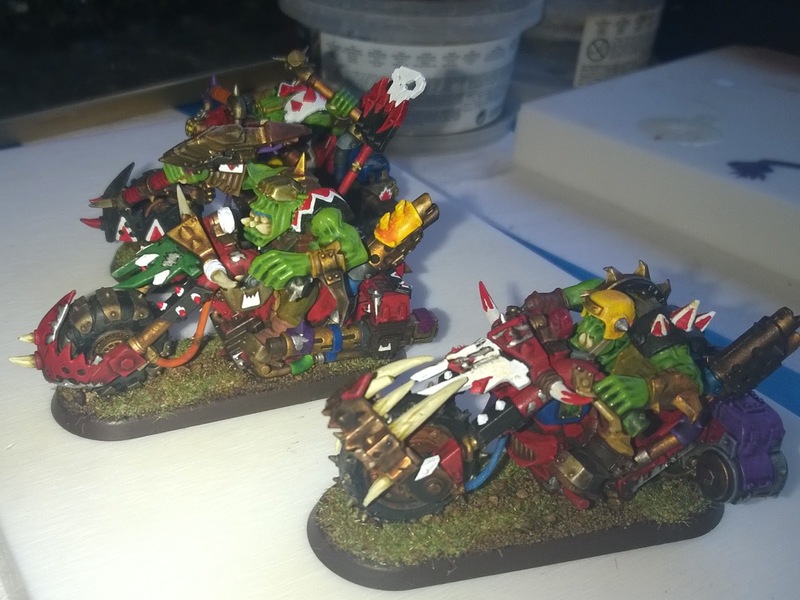 Hope you like the simple conversions comments are welcome. 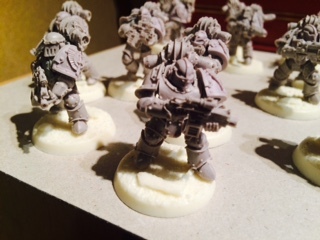 The Dark Angels finally have heresy parts and although expensive I wanted all the models to look top draw. 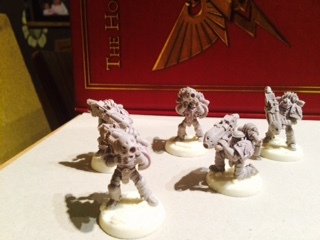 I have purchased the Battle for Calth but also lots of other MKs through forgeworld. I wanted a mixture in the army to reflect the different armour used at the time. Plasma - love the look of the 30K plasmas! Still work in progress the tracks are particularly challenging! Command Squad with dark angel parts need that fearless option! Plasma, plasma, plasma, I have always lined my 40k DA's up with plasma now the 30K dudes can have some. Bit static pose but for the money well worth it! Hope you like the build will show you more as I get into it. So Ho Ho Ho Horus Heresy came and went and the code on the whole did badly. We were saved by Toonboys brothers showcase of Primarchs which were fantastic! I hope you enjoyed them I certainly did. The fact still remains however, that us code boys are still sitting on a whole load of Resin - Innermech, Doc, Lukodakka and Redmist in particular. So I was over Innermechs yesterday and to my surprise sat there were lots of built heresy models the lad had been really busy! Not only that but he must be skint! 5 more deathshrouds, this now gives me 10 of these built. 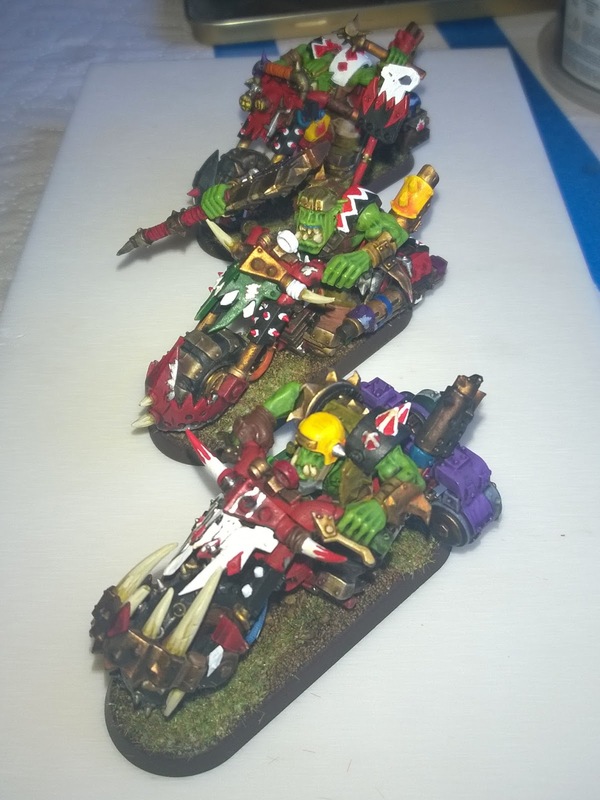 Although a warpage issue needs fixing as illustrated by the second photo! Finished the build on my breacher sergeant now my mk3 close combat weapons have arrived. I used the head from the rapier guy to make a better looking sergeant. 2 Apothecaries, every good death guard needs feel no pain right! Praetors - alternative leaders for when you need them. Put these guys on code design bases. 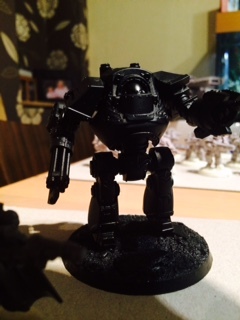 Contemptor number 2, haven't decided yet if I will magnetise the arms or not. I have a power fist and plasma arm for this guy magnetised from first contemptor which is completed as a mortis pattern. Tempted to order volkite arms for this one? 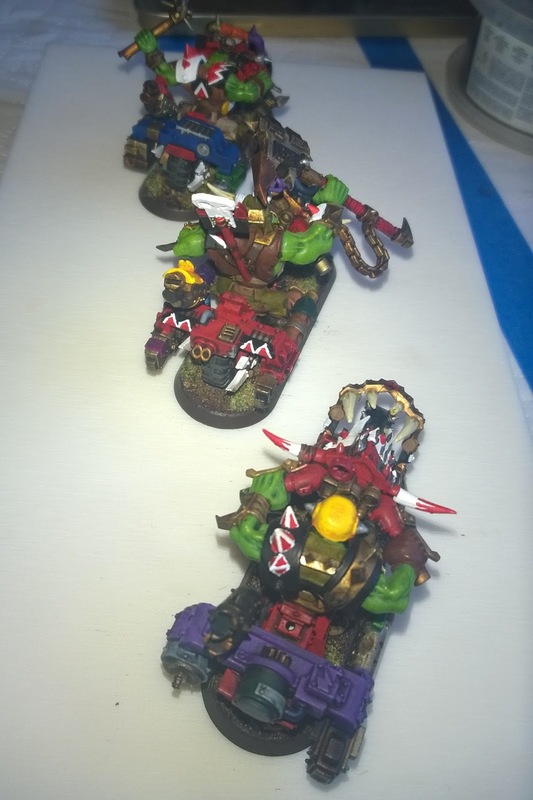 Not content with just doing heresy as Boss Bludtoof mentioned we are committed to a campaign. So I have also been putting stuff together for the first two games of the campaign. Being a cheepskate and guard are cheap I am making all the guard heavy weapon options from one box. Today I built up the autocannons for the 19th Dicers Regiment. I am currently formulating the background for this regiment. I think I am going to play a regiment which is on the edge of slipping to chaos and have been sent to colonise a planet after a successful campaign against the 7th black crusade. The planet is a bit of back end of the galaxy type and resentment to there honoured settlement rights is growing. I will expand this background a little further once we get in to the campaign proper. 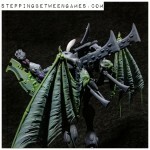 Right hope you like my great British Build off next time I will share InnerMechs Dark Angel builds I mentioned above.